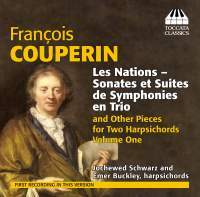 There can be no doubt that François Couperin was interested in as broad a sweep of his published music as possible. Of course, he planned for the generic scoring used to be available for whatever instruments happened to be at hand, and thus the salability of his works would be mightily increased. However, in 1725 he noted in the preface to his set of works dedicated to Lully that this apotheosis really ought to be done on a pair of harpsichords, one doing the basso continuo and the other the two melodic lines, even though he dismissively noted that “other” instruments might also be used. In this preface he also intimates that this preference would apply to a set of works entitled Les Nations which he was to publish the following year. When that edition appeared, however, there was no mention in the preface of his original intent, but rather he delineates a wide variety of other instruments with no mention of a pair of harpsichords. When looking for Couperin’s “original” intentions, the sources therefore are quite flexible, and each player or group of players probably ought just to perform the works, as they say, à son goût. So, here we have the first volume of a performance of this material by two harpsichords, which is perfectly in keeping with the composer’s preferences and consists of the second and fourth Ordre from Les Nations (the Piedmontese and the Spanish), along with movements from the first and third concert from the Concerts royaux, as well as a couple of movements from the Pièces de Clavecin. The first apparently have not been recorded in a two-harpsichord version before, though of course there are a number of discs with chamber settings out there. The first question that springs to mind is why Couperin would be so ecumenical in his choice of performance media, when he was more precise in his own wishes. The answer is, of course, that he expected these works to be performed more generically by whatever the performers had at hand, and to specify would have knocked a rather substantial portion of his market right out from under him. This is entirely understandable, but what is less easy to fathom is why his own preference, which surely must have reflected his own taste and intent, has been more or less ignored for so long. No matter, the indication is that this is the first volume of several, and now one can do a comparison between the various chamber settings and Couperin’s own ideas. So, how do these compare? The answer is that the harpsichord is aurally more unforgiving and therefore the sound is often pointed and raw, especially since both instruments have to have more or less the same registration to be compatible. The result is a vibrant and virile sound that is immediately grabbing. With no place to hide, the often close harmonies and piquant counterpoint seems to come alive. For example, in the fourth Ordre of Les Nations, there is something nicely peasant-like in the third movement, marked Vivement, with its sudden and unprepared minor key final cadence, something that sounds softer and more diffuse with another ensemble. The second air offers a nice contrast in registration that sounds like an effete minuet that suddenly turns sharp and crystalline in sound. The sixth movement, the Rondeau, is likewise clear and precise, though a softer registration on some of the second phrases ameliorates the effect somewhat. Here, too, the quirky harmony of the main theme is not disguised but come through unambiguously. The ostinato bass line of the mysterious barricades sounds like a crib from Pachelbel’s notorious canon, less a theme and variations than a long chaconne with the plunk of the bass theme clear throughout. Fortunately, it does not go on long enough to become the inevitable earworm. Plus, there is a nice harp register variation at the conclusion that sort of fades away into the final notes of the lone bass theme. In the second Ordre, L’Espagnole, the performers trade off the lines, using their keyboards in a more varied manner. This is evident in the Badinage movement, where this clarifies the often gnarly counterpoint. In the final Passacaille, the cultured court mannerisms peer forth from the continuous variations, all at once deliberate and pointed. The playing by harpsichordists Jochewed Schwarz and Emer Buckley is finely matched. Both blend well with each other and provide a strong, virile performance that brings the nuances and ornaments of Couperin’s music to life. One can see through their interplay why the composer considered this his ideal performance medium. Since this is billed as the first volume of a series, I for one am looking forward to the rest. In my opinion, this is the way I would conceive the composer presenting his works to the highest French nobility, leaving the more generic instrumentation to lesser gens.